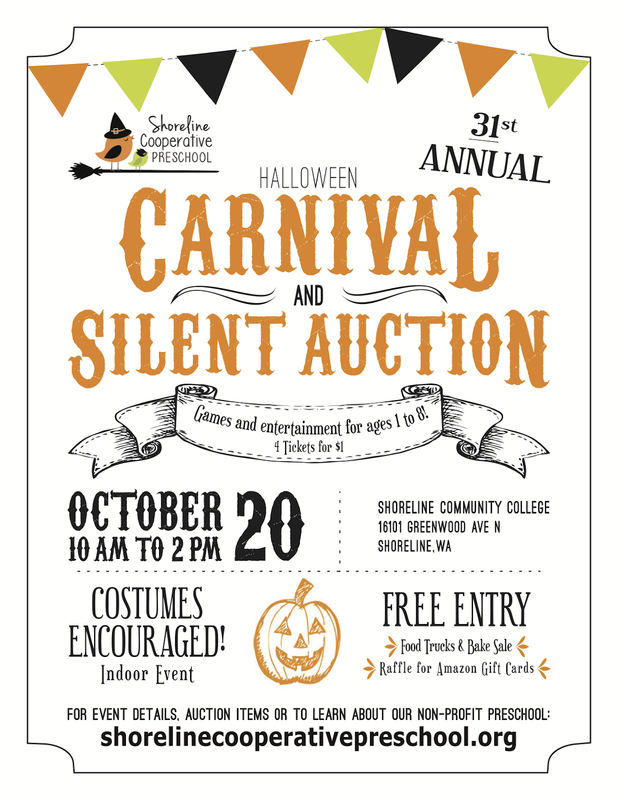 Shoreline Cooperative Preschool is hosting its 31st Annual Halloween Carnival and Silent Auction Fundraiser! Bring your kiddos in their costumes for carnival games and prizes, face-painting, balloon artists, a raffle and more! Games are designed for children ages 1 to 8 but will be fun for the whole family! There will be food trucks and tasty Halloween treats as well. Free Admission, game tickets 4 for $1. The legendary silent auction boasts bid-worthy gift certificates, Disneyland tickets (! ), food and wine experiences, book and music packages, and much more! Admission is FREE and carnival game tickets are only 4 for $1. All proceeds support SCP, a nonprofit preschool. This INDOOR event will be held in the Pagoda Union Building (PUB) at Shoreline Community College, 16101 Greenwood Ave N, Shoreline on Saturday, October 20th from 10am to 2pm. See you there! If you would like to donate and support our school in its new location, please see our fundraising site.